RESTON, Va. ��� Recreation Vehicle Industry Association���s (RVIA���s) newest media spokespersons, the DiEugenio family, will promote RV tailgating and family RV travel as they embark on a tour of NFL football games for the 2006-07 season. The tour will continue through the Super Bowl with stops in major media markets like Houston, Kansas City, Pittsburgh, New York, Miami, Cleveland, San Diego and other cities with AFC football teams. Jay and Karen DiEugenio, along with their three young sons, Nick (14), Luke (12) and Frankie (5), pursued a lifelong dream of tailgating at NFL games around the country last year. They visited all the cities with NFC teams in their RV and published a tailgating cookbook called I Got Your Tailgate Party Right Here. The DiEugenios enjoyed their RV travels so much that they decided to visit all the AFC stadiums for the 2006-07 football season. This year���s tour will be substantially upgraded with laptops, digital video and still cameras. The RVing family will have an active blog and vlog on their YourTailgateParty.com website, with links to the GoRVing.com website. The kids will be ���road schooled��� during the trip with schoolwork and encouragement from their local school district. RVIA���s marketing communications agency, Barton Gilanelli, will arrange media interviews with the DiEugenios during their NFL tailgating tour. 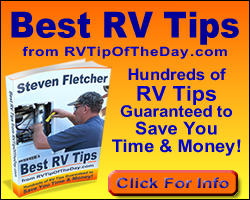 They will promote GoRVing.com in every interview as the best resource for families interested in RV travel. They will also discuss the advantages of tailgating in an RV and the many discoveries they have made while touring America by RV. Fleetwood RV is providing the DiEugenios with a 2007 Bounder Diesel Type A motorhome for this NFL season. Amenities includes slideouts and a satellite dish-ready 26��� LCD TV with home theater sound system.